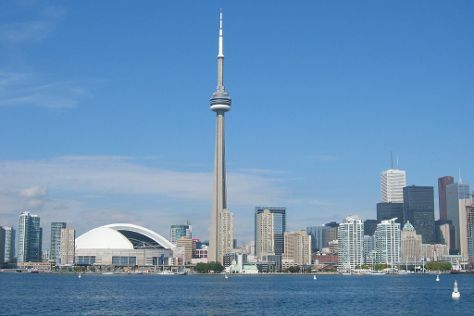 Kick off your visit on the 11th (Sat): contemplate in the serene atmosphere at St Michael's Cathedral Basilica, then admire nature's wide array of creatures at Ripley's Aquarium Of Canada, and then take in panoramic vistas at CN Tower. On your second day here, see the interesting displays at Royal Ontario Museum, step into the grandiose world of Casa Loma, and then take in the spiritual surroundings of St James Anglican Cathedral. To find reviews, maps, more things to do, and more tourist information, refer to the Toronto road trip app . Boston, USA to Toronto is an approximately 4.5-hour flight. You can also do a combination of flight and bus; or drive. In May, daily temperatures in Toronto can reach 67°F, while at night they dip to 50°F. Finish your sightseeing early on the 12th (Sun) so you can travel to Ottawa. Start off your visit on the 13th (Mon): take a stroll through ByWard Market, contemplate in the serene atmosphere at Notre Dame Basilica, then get a sense of history and politics at Parliament Hill and Buildings, and finally enjoy breathtaking views from Peace Tower. For photos and tourist information, you can read our Ottawa trip itinerary website . You can fly from Toronto to Ottawa in 3 hours. Other options are to take a train; or drive. In May, daytime highs in Ottawa are 68°F, while nighttime lows are 47°F. Cap off your sightseeing on the 13th (Mon) early enough to travel to Levis. Kick off your visit on the 14th (Tue): make a trip to Notre-Dame Basilica, then take in nature's colorful creations at Montreal Botanical Garden, and then take in the spiritual surroundings of Saint Joseph's Oratory of Mount Royal. To find other places to visit, where to stay, reviews, and more tourist information, you can read our Montreal day trip planning site . You can take a train from Ottawa to Montreal in 2.5 hours. Alternatively, you can drive; or take a bus. Expect a daytime high around 68°F in May, and nighttime lows around 50°F. Finish your sightseeing early on the 14th (Tue) so you can travel to Levis. Lévis is a city in eastern Quebec, Canada. 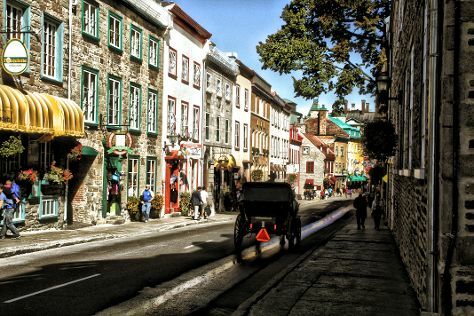 Start off your visit on the 15th (Wed): appreciate the extensive heritage of Terrasse Dufferin and then get to know the fascinating history of Old Quebec. Get ready for a full day of sightseeing on the 16th (Thu): stroll around Parc de la Chute-Montmorency, get engrossed in the history at La Citadelle de Quebec, and then take in the architecture and atmosphere at Saint Andrew's Presbyterian Church. To see more things to do and tourist information, you can read our Levis tour itinerary planning website . Traveling by car from Montreal to Levis takes 2.5 hours. Traveling from Montreal in May, expect Levis to be little chillier, temps between 63°F and 45°F. Finish your sightseeing early on the 16th (Thu) so you can travel back home.